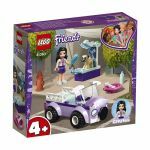 Meet the LEGO Friends: Andrea, Mia, Olivia, Stephanie and Emma - and their cute animals in Heartlake City. Friends is a theme that LEGO unveiled in early 2012. It was designed to replace the Belville product range that appealed mostly to girls. 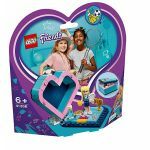 Similar to the doll-like figures included in LEGO Belville sets, Friends play sets also feature mini-doll figures that are more detailed than the traditional LEGO minifigs. The sets released under this theme mostly contain several purple and pink pieces. 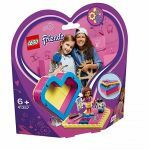 LEGO Friends follows five core characters: Emma, Mia, Andrea, Stephanie, and Olivia, and their favorite activities. The Friends theme takes place in the fictional land of Heartlake City, which houses a bakery, pet salon, a cafe, swimming pool, and other facilities that are perfect for characters interested in horse riding, aviation, and even karate. The Clover Meadows in Heartlake City is the place to go for picnics, while The Park serves as the venue for the Heartlake Dog Show. There is also an island off the coast of the city, and a coast line that is near the houses of Emma and Olivia. The main characters have unique interests and personalities. Mia is the outdoor-enthusiast who also loves animals, Emma is the artist who loves taking photographs and painting beautiful sceneries, Stephanie is the swimmer of the group who frequently goes on secret missions, Andrea likes to sing, act, and entertain, making her the performer of the group, and finally Olivia is the science fanatic that loves everything related to engineering, gadgets, and inventions. The largest set in the LEGO Friends series is the 41101 Heartlake Grand Hotel, which has 1,552 pieces for building the three-story Heartlake Grand Hotel. The set has a rooftop pool, a smoothie bar, a DJ booth, guest rooms, and a jazz bar. The hotel also has a stage where Andrea can perform, and a cafe where the characters can enjoy an afternoon sipping coffee and tasting some moist cakes.